Super famicom - anyone else collect them? I started getting games for the super famicom a few years back and suddenly stopped but here's mine. That's from top left to bottom right. 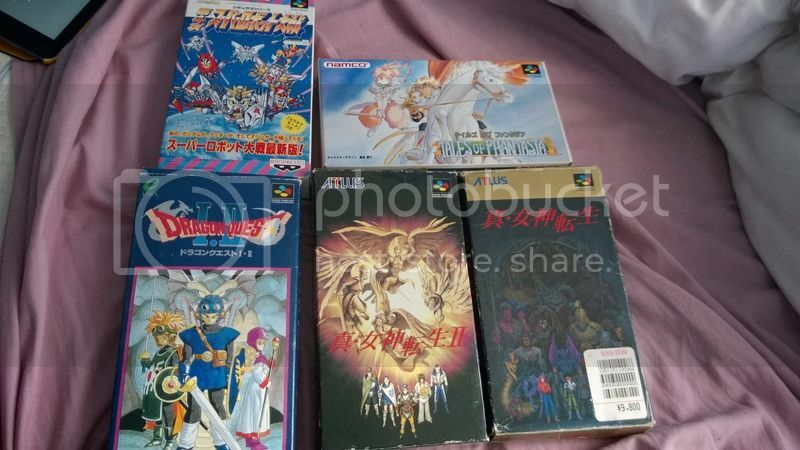 So it got me wondering, anyone else collect super famicom games? I'm always on the look out for games that are good. I did many moons ago now, and have to resort to emulation these days, but when I did, I had a few classics, I think I left the Snes with about 130 titles, but didn't venture into the Japanese ones as I wasn't going to take the works of getting something I couldn't even under stand and for those that do, back then, was a huge gamble. Re: Super famicom - anyone else collect them? Can't say I ever have but I admit to being intrigued. I am swaying away from over collecting now, so I doubt I ever will but I will be interested to see how you go. Oh yeah. I have Yoshi's Island, Lady Stalker, A Casino game (with bunny girls..), Super Bonk (the Japanese version has some cute differences that my son prefers), and a few others. I like to try to get lots at a time, as you will tend to overpay for what the Japanese may consider junk. I would love to get Dracula X, Final Fight 3 and 2 (there are some differences between regions on those), Castlevania IV, Super Metroid, Contra III, and a few others. There are a lot of differences between regions and I like to find the best games. I was surprised to find that Contra on the NES was actually missing background animation from it's Famicom counterpart. The best music in Famicom games can be found on Famicom Disk System games. Konami games in Japan sometimes have an additional chip that enhances sound. The outside-of-Japan ports don't have these features! I've heard better music for several Japanese games on several systems (Master System comes to mind), and also found more animation and many graphical differences (usually based on taboo, religion, misconceptions, etc..).